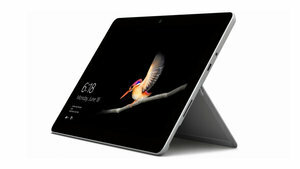 Home Blog Windows Device The Surface Go – Has it Found its Niche? 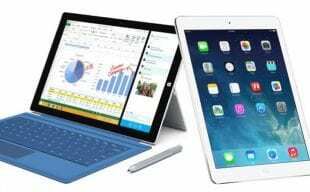 The Surface Go – Has it Found its Niche? The Surface Go is like a baby Surface Pro, with its full-range kickstand, great display, and Windows Hello facial recognition camera all packed into a tiny 10-inch device and offering, perhaps surprising, level of performance. When it was first released there was some confusion as to where it sat in the market. Was it just another tablet for personal use, or could it be an option for business too? 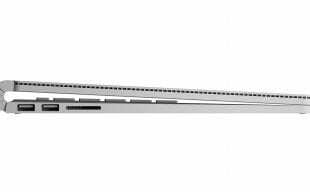 Was it a direct competitor to the iPad, or the Chromebook? Where does the Surface Go work best? As we get to know the Surface Go, it’s become clear that it’s really neither of those things, it sits in it’s own niche and is a great mobile device – funny that, with it being called the ‘Go’ and all… So while you can experience performance issues if you try to push the Go too far beyond basic tasks, such as editing photos in Photoshop, if you’re out and about and need to do some light editing, the Surface Go will handle easily handle it. Battery life is around nine hours, so you can be out all day and not need to charge the Go but if you do you can use either the USB-C port or the Surface Connector to add power while you’re mobile. The keyboard and trackpad on the Surface Go work well, despite the small size – and you can buy the Alcantara version as an additional option to give it that luxury feel. For those concerned about how robust the Surface Go is, there are lightweight military spec cases available to keep your Go safe while you’re on the move. This opens up the Surface Go as an option to not only creative or business users heading out to meetings, but also to other users such as those in the construction industry visiting sites where they could take a battering. So whilst the Surface Go may be slightly lacking as a pure tablet device, and not quite a laptop, as a mobile option for anyone who is on the move a lot and needs the flexibility and performance of a small, portable, yet robust, device, it’s a great solution. 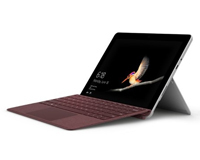 You can lease a Surface Go with 8GB RAM, 128GB SSD and Intel HD Graphics 615 from £4.90 per week. If you’d like to find out more about the Surface Go and leasing options, give our Sales team a call on 020 7111 1643 or you can talk to them via our webchat on the website. 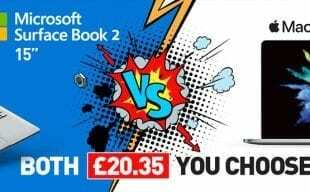 Alternatively, you can email sales@hardsoft.co.uk.